EXPERIENCE THE BENEFITS OF THE PREMIUM UPLIFT BEAUTY ROLLER - Our high quality roller gives you the experience of a High End Spa with a unique 6 sided hexagon shape that holds 30 Germanium Infused Massaging Stones that will enhance, energize and revive the skin. 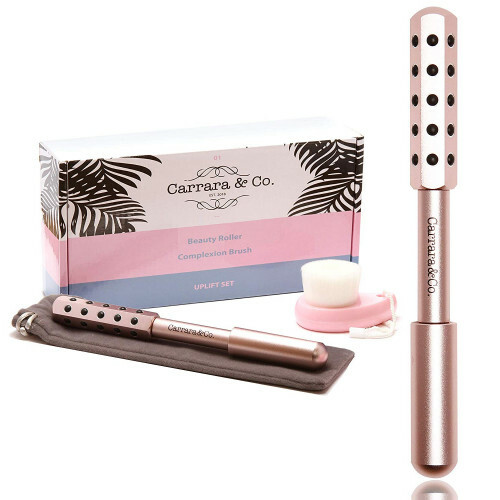 THE MASSAGE TOOL CREATES A UNIQUE PULSE ROLLING ACTION THAT REPLICATES TECHNIQUES USED FOR FACIALS AT HIGH END SPAS - It helps improve the skin to look more youthful and is suitable for any skin type. 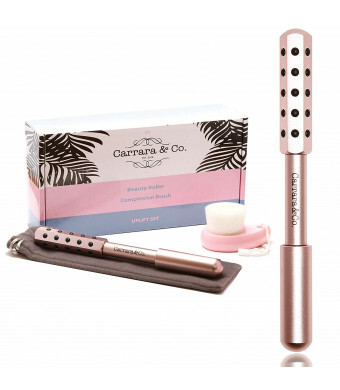 It is the perfect roller to use with any creams and serums to keep the derma looking uplifted. THE PREMIUM BEAUTY UPLIFT ROLLER IS MADE FROM PURE ALUMINUM WITH GERMANIUM INFUSED STONES - Use daily 3 times a day for 3 minutes to experience refreshing results. It can be used with facial masks and a better alternative to the Jade roller and Rose Quartz rollers. Add the Beauty Roller to your morning and night routine. It can be used for the Face, Chin, Jaw Line, Brow Area, Under Eyes, Cheeks, Neck, Hands, Arms, Back, Chest, Legs and Feet. FEEL THE ULTRA SOFT LUXURIOUS COMPLEXION BRUSH - The brush exfoliates deep into pores and can be used with any skin care cleanser. The facial brush softly & gently brushes & washes dirt, oil, makeup residue, bacteria, dry skin and other impurities. The brush is made of the highest quality Wool. It is portable and there is no need to change the scrub heads, simply wash and reuse. 100% SATISFACTION GUARANTEED - Our beauty roller comes with a 30 day money back guarantee and a ONE YEAR replacement warranty. The Perfect Gift For: Christmas, Birthdays, Honeymoon, Anniversary, Weddings, Wedding Anniversaries, Bridesmaids, Girlfriends, Mothers, Sisters, Holidays, Woman, Men and Graduations.